Turkish cargo jet crashed near Kyrgyzstan’s Manas airport on Monday, killing at least 37 people, most of them residents of a village struck by the Boeing 747 as it tried to land in dense fog, Kyrgyz officials said. According to the airport administration, the plane was supposed to make a stopover at Manas, near the capital city Bishkek, on its way from Hong Kong to Istanbul. It crashed when trying to land in poor visibility at 7:31 a.m. (08:31 p.m. ET). The doomed plane plowed for a few hundred meters (yards) through the village, shattering into pieces and damaging some 15 buildings. 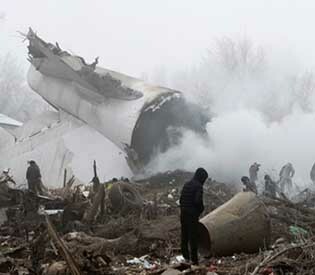 Initial estimates put the death toll from the crash at 37, said Kyrgyzstan’s emergencies ministry. Kyrgyz officials initially identified the Boeing 747-400 as belonging to Turkish Airlines , but Turkish cargo operator ACT Airlines said the jet was theirs. “Our TC-MCL signed plane, flying on Jan. 16 from Hong Kong to Bishkek, crashed on landing at Bishkek at the end of the runway for an unknown reason,” ACT Airlines said in an emailed statement.